A map of a Mexican-American War battle that took place in Pasadena. Sketch of the Battle of Los Angeles Upper California, fought between the Americans and Mexicans January 9th, 1847. 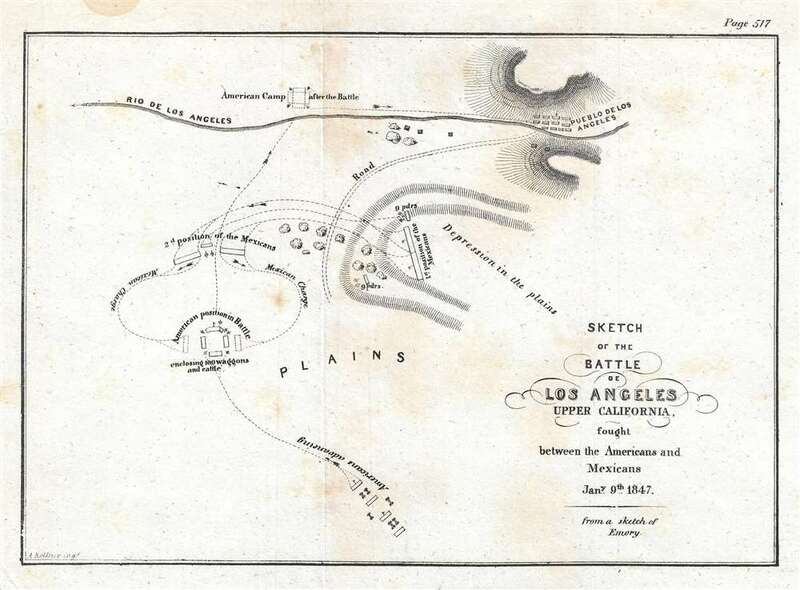 This is an 1847 William Hemsley Emory map of the Battle of Los Angeles, California, which occurred on January 9, 1847. The map depicts the American contingent led by Commodore Robert F. Stockton in the final day before the force reached 'Pueblo de Los Angeles'. Although only a sketch, the map details the last engagement between Stockton's contingent and the Californians under the command of Jose Maria Flores. This final engagement took place at La Mesa (located in modern-day Pasadena), after Flores and his men had suffered a defeat in the Battle of San Gabriel. The march on January 9th began at 9 a.m. and followed closely followed the same route as today's Olympic Boulevard. Californian scouts and small raiding parties harassed the advancing troops, but nothing more serious materialized. That changed after Stockton's column entered La Mesa, a wide plain south of Los Angeles. Flores and his men appeared on a high crest to the right of the Americans, who had a ravine on their left. The American forces, commanded by General Kearny, formed a box around their supplies and livestock, and prepared to be charged. After an exchange of artillery fire, the Californians charged and tested all sides of the box, but to no avail. The Americans' superior firepower was too much for the attackers. After the Californians withdrew, the American force continued across La Mesa and eventually forded the Los Angeles River close to what is today the Washington Boulevard crossing. This map was engraved by Augustus Kollner from a sketch by William Hemsley Emory and published in 1847. Though fairly well represented in institutional collections, this map rarely appears on the private market. Augustus Kollner (1812 - December 10, 1906) was an artist, engraver, and lithographer based in Philadelphia. Born in Wurttemberg, Germany, Kollner began his career in Germany, working as a book illustrator in Stuttgart and Paris in the late 1820s and 1830s before immigrating to the United States in 1839. After settling in Washington, D.C., Kollner worked as a lithographer for the Haas firm, working on advertisements, bank notes, and city views. He moved to Philadelphia in 1840 and tried unsuccessfully to establish himself as a portrait painter. After this misstep, Kollner became the second chief artist of P.S. Duval and William Huddy's 'U.S. Military Magazine' (1839 - 1842). Throughout the 1840s, Kollner worked as a lithographer for many different Philadelphia based lithographic firms, including Duval, J.T. Bowen, Frederick Kuhl, Thomas Sinclair, and Wagner and McGuigan. Between 1847 and 1848, Kollner began working for the lithographic firm Brechemin and Camp, for whom he designed all genres of lithographs and advertised his own lithographic views based on his annual summer sketching trips along the East Coast. His work also began to be published in the seminal series 'View of American Cities', published between 1848 and 1851 by Goupil, Vibert, and Company. While working for Brechemin and Camp, Kollner was responsible for creating the multi-foot Dripp's map of New York City. Kollner established his own firm in 1851 and worked on a wide range of projects, including advertisements, labels, city and landscape views, and maps. During the Civil War, Kollner enlisted in the cavalry in 1863 and later sold photographic reproductions of the etchings he did as a soldier. He produced his last series of landscape lithographs entitled 'Bits of Nature' in 1878, but focused mostly on his watercolor work during the late 1870s. Kollner retired in the early 1880s, but continued to make sketching trips around the Philadelphia area. Kollner married Mary Sheek (c. 1821 - 1899) in 1843, and they had several children, three of which survived infancy: William, Clara, and Josephine. Kollner died on December 10, 1906. Very good. Even overall toning. Light soiling. Light wear along original fold lines. Blank on verso.